Durable bracelets made of resilient silicone. Each embossed with popular words and phrases. Great rewards or team-building giveaways! 2-1/2" diameter. Pack of 24 each. Inspiration on the go! Durable bracelets embossed with popular words and phrases: Spirit (orange), Courage (yellow), Strength (blue), Believe (green), Dream (pink), Hope Faith Love (pink), Live Healthy (turquoise) or Best Friend (purple). 2-1/2" diameter. Pack of 24 each. No color choice. Bracelet colors may vary slightly. I was a career day speaker at a middle school. I brought these wristbands with inspirational words Believe Strength or Courage to give the students. They loved them! Boys and girls alike were excited to receive and wear them. 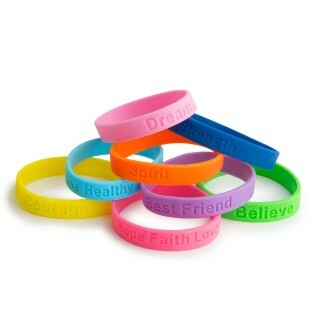 These are very well made inspirational phrases silicone bracelets. The colors are vibrant and eye catching and there are lots of phrases to choose from. Would have liked an assortment option but I always keep extras for prizes and rewards. The size is perfect for elementary-aged kids. Very popular w/young people...trendy and conveys a message in a stylish and youth-approved way! Our Girl Scouts love these. They collect the different colors phrases.